A Fire-Eater Sat on my Lap . . .
Well, we head out again tomorrow. This time to Texas, then from there driving to PA through a series of pit-stops. Should be lots of fun!! We’re excited. But, in the midst of all of this, I have realized that my aspirations of posting regularly and of good quality have not been coming true. I’m not sure if it is due to lack of time or motivation, or just not feeling like I have much worth writing about at the moment. Whatever it is . . . it is. I do however have a short story to share with you. I had planned to share it on Friday, but then I posted a review for Tyndale on Friday, and I started realizing that even with some stretching my story wasn’t going to be very long. So, here it is. Basically, a fire-eater sat on my lap and ate fire. That’s the gist of it. We were enjoying an awesome cultural evening during our time in Senegal which was complete with traditional music and dancing. Then, all of the sudden, out comes a fire-eater (which I have only ever heard tell of and have never witnessed before). He began with some dancing with fire, then a little bit of blowing fire, then rubbing fire up and down his arms and legs. My teammate got to hold his little bowl of coals while he was doing something early on in his show, and I thought to myself “Wow, cool, she got to be a part of his show!” (read: a little jealous). Next thing, Mr. Fire-eater has two long sticks with what looks like flaming marshmallows on the ends (but, they weren’t marshmallows, just for the record.) He dances around a little and then goes and sits on some lady and starts eating the flaming things off of the stick. Then . . . next thing I know . . . he is sitting on MY lap, eating flaming things off of his stick! So, please, any of you with similar experiences – what reaction does this warrant? I was not completely sure what to do, but I guess that was okay, because sitting there looking terrified seemed to be sufficient. Jealousy was gone. A little bit of awkward giggliness was in its place. But it was one of the coolest experiences of my life. So many adventures . . . so little time left! I’m tired! It’s been a bit of craziness around here. This is the last week of school – which is actually extremely saddening when I think of the fact that some of these kids, if not all of them, I will never see again after 4 days. I love them so much!! But, at the same time, who isn’t excited for summer? So . . . I have a feeling this will be one of those weeks where my heart gets stretched in all directions and I don’t really know what to do. But . . . the end will come and go, and new beginnings will start, and there’s not a whole lot I can do other than just enjoy the ride! This last week was quite exciting in several different ways. We had company on Thursday night – the first night in months that our power decided to go out. Thank heavens for candles and a big street window! 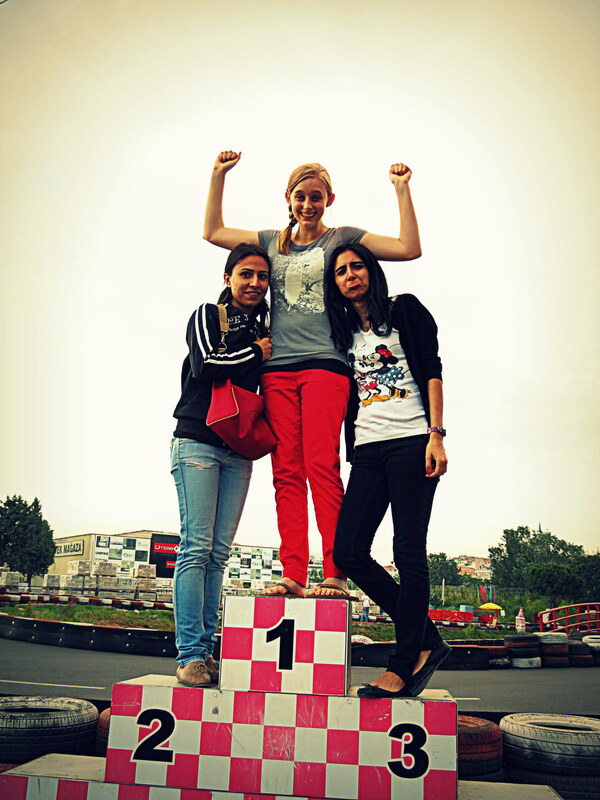 On Friday I went go-karting for the first time. One word . . . AWESOME!! I loved it! Saturday was, quite thankfully, a relaxing day. I worked on plans for our summer English camp in Senegal that is approaching VERY QUICKLY, went on a walk with my awesome husband, got an ice cream cone, and then another because there was some kind of deal going on – so proceeded to walk around the park eating one and having one melt in my other hand. (They were packaged, so I did take it home and put it in the freezer. And I withheld it from Jeremy because he is allergic to milk. So take back all of those bad thoughts, please!) We also had some pretty good pizza calzones for dinner and watched Sherlock Holmes 2. Perhaps I’ll do a write up about it soon, but it’ll suffice for now to say – I really liked it. It was way better than the first Sherlock Holmes!! Sunday was busy, but good. We had our end of the year program for the Kindergarten at school. The Kindergarten has about 94 students or so, so it was a big deal. All of the students sang songs, participated in folk dance, modern dance, or ballet, and were part of an English skit and dance from some country in the world. My kids were from South Africa. 1. They were adorable. 2. They did awesome! I was so proud of them. I just stood behind the curtain with my stomach turning and my face smiling as I watched them perform their lines beautifully and then do their dance. It was great! I was so happy for them. Then, we also went to church on Sunday, but left fairly quickly to get home for our apartment complex “Say Hello to Summer” party. It was a great family party with food, games, clowns, live music, and fireworks. There was a particularly moving dance between one of the clowns and a security guard, and I couldn’t help but laugh when Jeremy’s friends pulled him into the middle of the dancing! Haha. It was great. It was super fun to just go out and see all of the other people who live near us, and we know a few of them from either school or sports. It was a good start to summer – but one more week of school to go until that is official! Hope you’re all enjoying your start to summer! Let me know what your biggest plans are! Ours are Africa – PA – NC – SC – OH – CO – Istanbul, in roughly that order. 🙂 Have a wonderful week! Try to enjoy both the ends and the beginnings, and don’t forget to be where you are right now!! I realize this is more of an education post and belongs on my other blog, (and it is there too, so sorry if you read both!) but I wanted to apologize for the lack of posts recently and at least get something up. Besides, there will probably be more thoughts to come from this author on here in a few weeks, so I’ll go ahead and introduce you to him. Meet Paulo Freire . . . This is the road I have tried to follow as a teacher: living my convictions; being open to the process of knowing and sensitive to the experience of teaching as an art; being pushed forward by the challenges that prevent me from bureaucratizing my practice; accepting my limitations, yet always conscious of the necessary effort to overcome them and aware that I cannot hide them because to do so would be a failure to respect both my students and myself as a teacher. Curiosity: the essence of Friere’s philosophy of education.